Compounded rubber is transferred, injected or simply put into a heated molds, and cured to obtain required size and shape under pressure. This is the difference between corresponding linear dimensions of the mold and of the molded part. All rubber materials display some amount of shrinkage after molding when the part cools. The mold designer and the compounder must measure the amount of shrinkage and which is incorporated into the size of the mold cavity. Even though the mold is built to anticipate shrinkage, there is always an inherent difference which must be covered by adequate dimensional tolerance. Complex shapes in the molded rubber goods may restrict the lineal shrinkage in one direction and increase it in another. 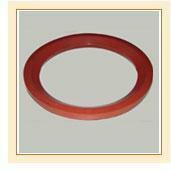 The rubber manufacturer always aims at minimizing these variables, but they cannot be eliminated altogether. Molds can be designed and built to varying degrees of precision at different cost. With any type of mold, the mold builder must have some tolerance. That is why, each cavity has some variance from the others. Dimensional tolerances on the rubber product must include allowances for this fact. Most molded rubber goods are made in two plate molds and the complicated ones require three or more plates. The main purpose of trimming and finishing operations is to remove rubber material, like flash, which is not part of the finished product. This is possible often without affecting important dimensions, but insome cases, some material is removed from the part itself. Most insert materials like metal, fabric, plastic, etc. have their own standard tolerances. When designing inserts for molding to rubber, other factors like fit in the mold cavities, location of the inserts with respect to other dimensions, proper hold spacing to match with mold pins, the room temperature must be considered. Since rubber is a flexible material affected by temperature, distortion can occur when the part is removed from the mold or when it is packed for shipment. This distortion makes it difficult to measure the parts accurately. However, some distortion can be minimized or removed by storing the part as unstressed as possible for 24 hours at room temperature. Temperature: Rubber changes in dimension with changes in temperature. It is necessary to specify a temperature at which the parts are to be measured and the time required to stabilize that part at that particular temperature. Humidity: There are few rubber materials which absorb moisture. Hence the dimensions of the products are affected by the amount of moisture in it. This can be minimized by stabilizing the product in an area of controlled temperature and humidity for not less than 24 hours. Fixed Dimensions are not affected by flash thickness variation. Closure Dimensions are affected by flash thickness variation.